On Location With "Growing a Greener World TV"
It's time for the August update for the 'Spitfire' nasturtiums I'm growing along with other gardeners across the country for the GROW Project. From looking at many participating gardeners' results so far, it would seem that I'm having a similar experience as most of the others. I'm very impressed with Christina Salwitz's nasturtiums. No wonder she's the Personal Gardening Coach! I'm also a little envious, because my nasturtiums don't look like hers. They got off to a great start, and they've been blooming just fine, but they've yet to "climb" or vine in any way. I thought they'd be at least halfway up the teepee trellis I made for them by now. They're still exhibiting variations in bloom color. Some are lighter, but I prefer the darker. I like 'Spitfire' but I was hoping they'd climb more than they have. I might grow them next year and have them vine down instead of having them try to climb up. "I'm growing Nasturtium "Spitfire" for the GROW project. Thanks to ReneesGarden.com for the seeds." Mine aren't climbing, either, but at least yours are sprawling! I don't have luck with nasturtiums so I can't help you any. At least you have a few blooms. 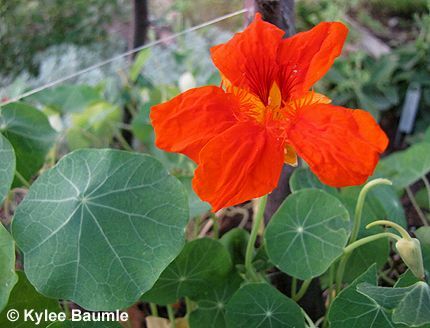 Anonymous ~ This particular type are labeled "Climbing Nasturtium" and though they don't have tendrils or aerial roots like most climbing plants, they should grow long enough that with some help, they can grow up a trellis. They just aren't doing anything any differently than any other nasturtiums I've grown. Monica ~ Well, sort of, but they aren't even really doing that. I planted all the seeds in the packet in this area, except for two. So you're likely just seeing lots of plants rather than sprawling much. They are attractive though! Lisa ~ I've grown nasturtiums before and I'm growing a different kind this year in another location, so they do okay for me. I've seen some that do fabulously for other people though, and I want nasturtiums like those! LOL. Kylee, I think yours look great. Even if they're not climbing, at least they're blooming. Mine are climbing, but haven't bloomed since mid-June. You sure do got a lot of blooms. In my garden things seem to have cooled off enough for them to start vining and blooming. I started to train them up the bamboo stakes today. At least you have lots of blooms! Mine have actually vined along the ground quite a lot, and I was able to drape some of those up and over things. Of course I have some others that did nothing. This variety seems to be very fussy about its conditions! I concur with your assessment Ms. Kylee. But your clumps look a lot better than mine. Right now I'm dressing up a section out front where I tossed a few nasty seeds and I'm going to make it look nice for an ending 'Spitfire' photo session. These clumps are growing in gravel! But you won't be able to see the gravel once I mulch. 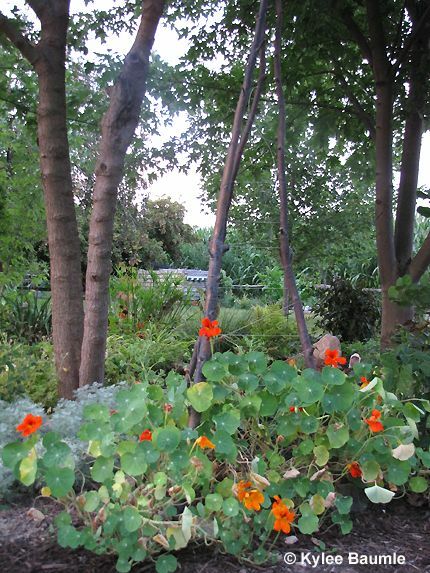 There are 'climbing' nasturtiums (they do climb but sometimes need a bit of encouragement), and bushy nasturtiums and more sprawly, Givernyesque nasturtiums. It depends on the variety. 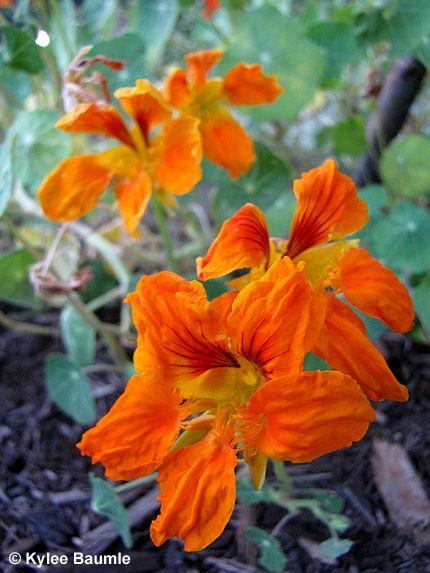 In fertile soil, nasturtiums often make more leaves than flowers; rather like cosmos in that respect. They tend to love my sandy, somewhat lean soil, so I always tuck them into corners of my garden. However, the ones I planted this year, a creamy variety called 'Milkmaid', aren't very happy. Perhaps it's the hot summer?